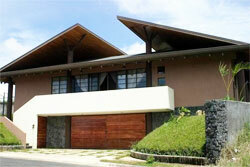 Alajuela (a prime area) has a rich landscape of mountains, volcanoes, forests, plains, and rivers. Its great diversity of plants, birds, and animals is protected in national parks and forest reserves. The province enjoys a moderate climate, and most areas bask in clean air. The Central, Tilaran, and Guanacaste mountain ranges rise over Alajuela and expand into lush forests and fertile plains. Cattle farms and sugar and coffee plantations dot the countryside. Alajuela is the breadbasket of Costa Rica, producing rice, grains, vegetables, and root crops in addition to sugar and coffee, its oldest export. The spectacular Arenal Volcano, one of the few active volcanoes in Costa Rica, is famous for its near-daily eruptions. Poás Volcano attracts visitors who come to its crater to watch steam geysers shoot up from the volcano’s depths. Poás rests inside a national park that protects forests and the northern river basins. Two must-see places in Alajuela is the Zoo Ave, which houses a large number of indigenous bird species, and the enchanting La Paz Waterfall Garden and Butterfly Observatory. Alajuela, the capital city, has a rich colonial history and a relaxed atmosphere. San Carlos, or Ciudad Quesada, is Costa Rica’s ranch capital and the site of the man-made Lake Arenal. The modern town of Grecia is known for the Catedral de la Mercedes, made of bright red metal. Alfaro Ruíz has the whimsical topiary gardens of Parque Francisco Alvardo. Atenas is a small rural community considered to have the best climate in the world. Once called Villa Hermosa (“beautiful village”), the still pretty Alajuela City sits on a hillside, and enjoys a warm climate. The local economy thrives on the sugar, coffee, and the cattle trade, and farms and coffee plantations can be found in the countryside around the city. Alajuela City does not receive many mainstream tourists, but it has a rich colonial history that can be seen in its lovely town centre. Fringed with mango trees, the centre becomes a gathering place when local musicians perform, or when people come to hear Mass in Alajuela Cathedral. The cathedral was built in the 18th century and is distinguished by its red dome and whitewashed walls. Alajuela is a modern city with several hotels, fine dining restaurants and fast food outlets, clubs and bars, movie theatres, bookstores, boutiques and well-stocked supermarkets. The environment is more relaxed here than in San José City, though. The Mango Festival is a much-anticipated event in the city. It lasts for nine days and features fairs and parades. Alajuela City is the historic hometown of Juan Santamaria, a poor drummer boy who became Costa Rica’s national hero. Ciudad Quesada, which most locals call San Carlos, is a small countryside town abundant in natural water, as many rivers and streams pass through it. Its soil is very rich and is suitable for crop farming and ranching. Some foreigners own ranches here. It is largely undeveloped and idyllic, but as a commercial centre, it can get busy and congested. It is the home of Lake Arenal, an important reservoir created from an existing, smaller lake. It supplies power to all of Costa Rica. Lake Arenal and its surrounding areas are very scenic. Nature trips, sailing and windsurfing are popular activities here. Some of the land around the lake is available for development. Ciudad Quesada has a spectacular view of the active Arenal Volcano, which regularly erupts in a magnificent display of fiery rocks and lava. It is a main tourist attraction and a photographer’s dream. The surrounding area of is a national park, and hot springs abound in the region.